We have a bunch of merchandise on our TeeSpring and RedBubble sites, explore our selection below, and purchase them on their respective websites! Here you Can view our extensive Teespring collections of shirts ranging from different sizes, styles, logos, and more! Anything from Trilobites to Tyrannosaurus rex! 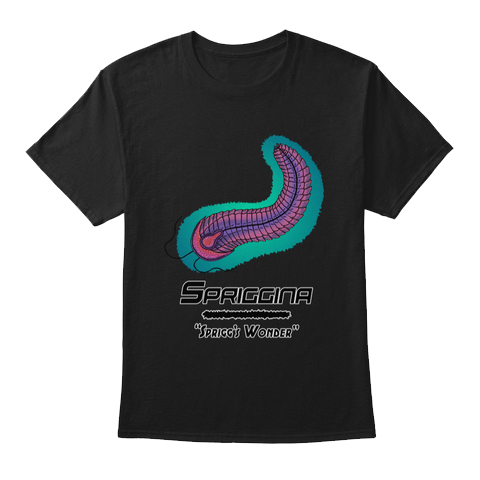 If you’re a fan of the earliest animal with a head, and want to promote E.D.G.E., get yourself a Spriggina shirt! The first animals were some of the strangest creatures to ever exist, and you can't blame them, they were literally trying things out for the first time. Meet Spriggina, a small little trilobite mimic with a long squishy body, and what may very well be the very first head on an organism ever. Mosasaurs were some of the most dangerous animals in the oceans, some could grow to the size of whales, others no larger than a sealion. No matter which way you slice it, Tylosaurus was one of the largest, and capable of taking down a multitude of equally dangerous water animals. You like EDGE? You want to support us? Mosasaurs make you warm and happy inside? Buy this shirt bro! We'll have Carlos the Chupacabra come after you if you don't! If you’re a fan of old depictions of Dinosaurs, and want to promote E.D.G.E., get yourself a RETROsaur shirt! Therizinosaurus was a very strange animal, no matter how it looked! It was originally discovered in the early 1900s, and only pieces of the arms were known. This monstrosity is the result! Paleontologists at the time assumed the 3 foot claws belonged to a vicious predator that butchered its prey with its scythe like claws!